Derek Stepan knows the drill. 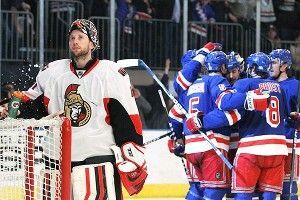 The Rangers had just defeated the Ottawa Senators 2-1 in Game 7 of the Eastern Conference quarterfinals, and Stepan was asked how long the team could celebrate the victory before turning their thoughts to the next round against Washington. “Probably an hour,” he said, kidding-except-actually-serious. Meanwhile, some of the Rangers’ usual offensive weapons were not to be found. Most notable among them was Marian Gaborik, who scored a goal in Game 1 against Ottawa and chipped in two assists in Game 4 but has been otherwise blanked. Gaborik’s renewed scoring touch this season — he netted 41 goals, just under his career high of 42 — was one big reason the Rangers had success; when a player like him gets cold, the team reverts to its old ways of not being able to score five-on-five when it counts. On the bright side, Gaborik’s slump resulted in more ice time for rookie Chris Kreider, who played zero regular-season games with the Rangers, won a national championship with Boston College, and joined New York just in time for playoff practice several days later. Krieder scored a goal in Game 6 and, more importantly, got the coaching staff to notice his defensive play. He was rewarded with 23 shifts of play (good for 18:21 of ice time) in the pivotal Game 7, including the final shift of the game. He had the best possession numbers of any Ranger besides Stepan. Tortorella spoke about how both he and Hagelin had earned themselves crucial minutes with their commitment to chasing down pucks, but that they’ve only scratched the surface of their potential. The Devils have some mouthwatering young players of their own. It was a particularly good week for 22-year-old Adam Henrique, who was named one of three Calder Trophy finalists for NHL rookie of the year, and who scored twice in the Devils’ 3-2 double-overtime Game 7 victory over the Florida Panthers. (His second goal was in overtime, Game 7, and the series winner, making him the first rookie to accomplish that since Claude Lemieux did so for Montreal in 1986.) But then again, it was a good season for Henrique, who emerged when Travis Zajac was sidelined with an Achilles injury and he was elevated to the top line. Centering Zach Parise and Ilya Kovalchuk, Henrique recorded 51 points in 74 games with the Devils, ranking third in rookie scoring; he also saw time on both the penalty kill and the power play. Asked about his goal, Henrique answered, inadvertently or not, in the language of youth. “I think I blacked out when I heard the thud of the back of the net,” he said. THAT’S how you WIN A DEBATE! While the Devils managed to fight back to claim the series, they did so while squandering advantages in individual games. Even in Game 7, New Jersey led 2-0 but allowed the Panthers to even things up in the third. After the game, Devils coach Pete DeBoer looked part relieved, part exasperated as he called it “a fitting end to the series.” I like to imagine that the two teams let the game go one full overtime and change in revenge to NBC, which forced them to begin play at 8:30 p.m. local time and stuck the game on the NHL Network until Rangers-Senators had ended — which was roughly a period and change into the game. With the win, the Devils move on to play the Philadelphia Flyers in one of two Mid-Atlantic showdowns, while the Rangers host Washington. (If ever you’ve wanted to see the biggest difference between the Eastern Conference and the West, get out your map and draw one circle that includes New York City, Philly, Washington, and Newark. Draw another around Los Angeles, Phoenix, Nashville, and St. Louis.) And so the fearmongerers who took the first round as an opportunity to fret about the catastrophic potential for a Florida-Phoenix Stanley Cup finals can find something else to worry about for the time being. While the Rangers will be back on the ice quickly, scheduled to host Washington on Saturday afternoon, the Devils’ first game at the Flyers is scheduled for Sunday, which might be why New Jersey goalie Martin Brodeur planned to bask a little longer in the first-round afterglow than his New York counterparts. “It feels pretty good for a day,” he said. On the other hand, maybe goalies just have more leeway, when they’re winning, to do whatever they need to do. Maybe they just don’t listen. Lundqvist has been repeatedly lectured about using his head to stop the puck; he did it again Thursday. When the Vezina candidate, seated in the locker room, was informed of Stepan’s “one hour” remark, you could practically see the pages of his social calendar flip through his mind.